What should I do/know as a first time Yammer user? What is the difference between internal/external groups and private/public settings? How do I add O365 Group features to my Yammer group? What do I need to know about external guests accessing a Yammer group? Can I use email to post to my Yammer group? What is my Yammer group's direct URL? First, check out this Yammer tutorial that walks you through how to connect to our Yammer network and edit your settings, discov and join groups/conversations and set up mobile apps. Internal/External - Determines if users from outside our organization can be added as members. When the Yammer group is first created, if it is INTERNAL - only System Office and CCC faculty/staff/students can be added as members or can join it. Users from outside our organization can only be added to EXTERNAL groups. NOTE: Once you create a Yammer group, you cannot change between internal/external, so know when you create it if you will want to add external members to the group. private/public - Determines who can see your conversations and post to your group. NOTE: You can change your group from private to public - but you cannot change it from public to private and make it unlisted in the directory. It will be listed if it was once public. 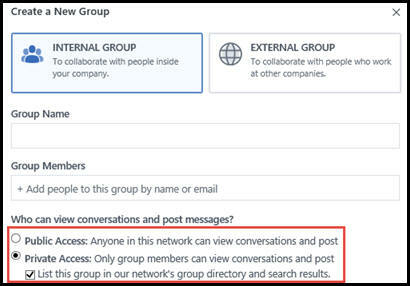 At this time, only Yammer groups that are internal and are listed in the directory can be O365 Group enabled. This Microsoft article shows you how you can tell if your group is O365 Group enabled or not. If your Yammer group is external, it currently does not support O365 Group features. Read this great article about O365 Groups and Yammer integration. External guests can only be added to an EXTERNAL Yammer group. And you cannot add aol, yahoo, hotmail accounts as members - they need to use their work emails. Here's Microsoft's link to What's new in Yammer.